My beloved and I went for a short ramble over Ilkley Moor yesterday, the first time since the spring. Imagine our surprise to find that they had put stone blocks down to make a path along one of the ridges and up to the radio towers at the top (not that there are any aerials on them now!) Joni Mitchell’s song “Big Yellow Taxi” came to mind with the lyric “they paved paradise and put up a parking lot”. I’m sure that there are good reasons for putting this paving up there, it makes it easier for people to cross the moor when it is so very boggy, it probably helps to reduce erosion, etc. but for me it really does spoil things. If I wanted to walk on a pavement I would have stayed down in the town. I find that what happens with the pavements on the moors is that I walk faster, see less and get sorer feet! But as my beloved pointed out, I’m just a grouchy old sod! 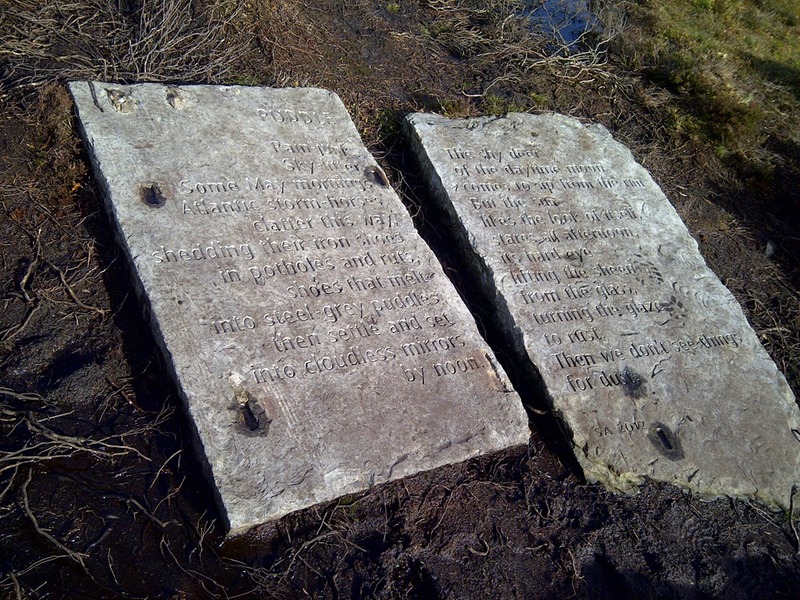 As we approached the radio masts we did find something quite beautiful though, a poem engraved into two of the slabs. comes to sip from the rim. A quick bit of research with Mr Google reveals that SA is the Yorkshire poet Simon Armitage. The stones were known as the Stanza Stones and were commissioned by Ilkley Literature Festival in collaboration with Imove and Pennine Prospects. For more information visit the Ilkley Literature Festival website and look for the Stanza Stones link. This entry was posted in Environment and tagged Ilkley Moor, poetry, Stanza Stones. Bookmark the permalink.